Wisconsin Gov. Scott Walker, who forced public workers to pay more for their pensions as part of a push to curb union rights, broke his campaign promise to pay the full cost of his state pension immediately after taking office in January. The Associated Press requested copies of the governor's pay stubs to see if he had fulfilled the campaign promise he made in June 2010. Walker said then he would begin paying the cost immediately in order to lead by example since he was proposing all state employees do the same. "As governor, I'll pay my share toward my retirement because everyone should pay their own way, including me," Walker said during the campaign. Lt. Gov. Rebecca Kleefisch made the same pledge and also didn't pay as promised. Walker's pay stubs provided Friday in response to the AP's open records request made in September had details about his pension payments redacted. But Walker's spokesman Cullen Werwie said the governor did not start paying the full cost until August, when the state law he pushed required elected officials and other state employees to contribute more. The requirement that state workers pay their 5.8 percent contribution was part of Walker's bill that also took away nearly all collective bargaining rights from most public employees. The fight over that measure resulted in protests as large as 100,000 people, led to all 14 Democratic state senators fleeing to Illinois to block the bill, and made Wisconsin the center of the fight over union rights. If Walker had fulfilled his campaign promise, he would have been paying his pension costs during that fight in February and March. Werwie did not have an explanation for why Walker didn't pay until the law forced him to. The law required Walker and other elected officials to make payments of 6.65 percent of their salary starting in August. That goes up to 7.05 next year. Somehow not fulfilling a campaign pledge - especially one regarding a highly disputed law - is fulfilling a campaign pledge. 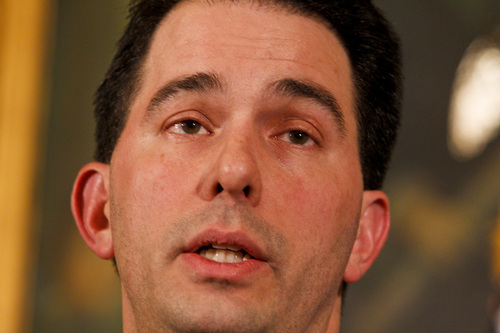 Walker's spokesman believes that "ultimately" they were "fulfilling what our campaign pledge was." This will be more fuel for the repeal of Scott Walker, who has demonstrated that he is nothing but a partisan liar.